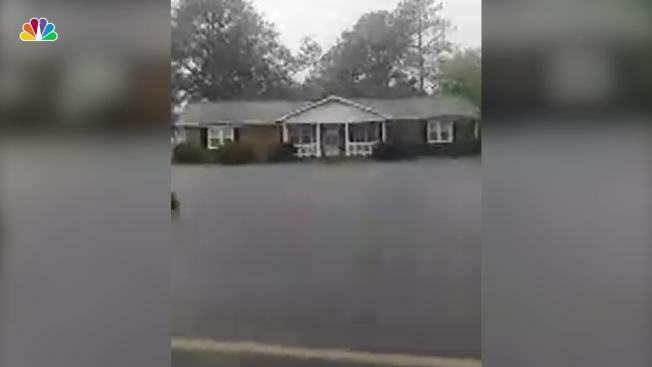 Video from New Bern, NC shows flood waters in the neighborhood rising as Florence continues to dump rain on the area. Blowing ashore with howling 90 mph (155 kph) winds, Florence splintered buildings, trapped hundreds of people and swamped entire communities along the Carolina coast Friday in what could be just the opening act in a watery, two-part, slow-motion disaster. At least five people have been killed. In Wilmington, first responders rushed to a neighborhood where a tree fell on the back of a home, trapping a father, mother and child, NBC News reported. The unidentified woman and 8-month-old infant were killed, Wilmington Police Chief Ralph Evangelous said at a news conference. The father was freed and taken to the hospital with unknown injuries, although a fire official said the victim had a "crush injury" and may have had a body part amputated, Holt reported. In neighboring Pender County, a police spokeswoman said a woman died after suffering a medical condition. She had called for assistance, but large trees blocked roads to her home, the official added. Two people died in Lenoir County, county Emergency Services Director Roger Dail said. A 78-year-old man was electrocuted while attempting to connect two extension cords in the rain, and a 77-year-old man was found dead Friday morning and he is believed to have been killed after being blown down by wind while going outside to check on his hunting dogs, Dail said. 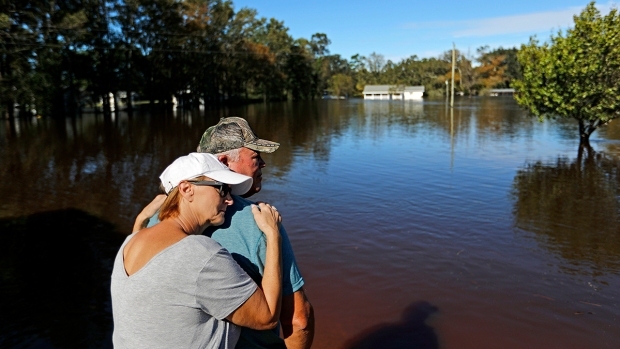 Forecasters warned that drenching rains of 1 to 3½ feet (30 centimeters to 1 meter) as the hurricane-turned-tropical storm crawls westward across North and South Carolina could trigger epic flooding well inland over the next few days. As 400-mile-wide (645-kilometer-wide) Florence pounded away at the coast with torrential downpours and surging seas, rescue crews used boats to reach more than 360 people besieged by rising waters in New Bern, while many of their neighbors awaited help. More than 60 people had to be rescued in another town as a cinderblock motel collapsed at the height of the storm's fury. Florence flattened trees, crumbled roads and the assault wasn't anywhere close to being over, with the siege in the Carolinas expected to last all weekend. The storm knocked out power to more than 890,000 homes and businesses, according to poweroutage.us, which tracks the U.S. electrical grid. North Carolina Gov. Roy Cooper called Florence an "uninvited brute" that could wipe out entire communities as it grinds across the state. "The fact is this storm is deadly and we know we are days away from an ending," Cooper said. Parts of North Carolina had seen storm surges — the bulge of seawater pushed ashore by the hurricane — as high as 10 feet (3 meters), he said. After reaching a terrifying Category 4 peak of 140 mph (225 kph) earlier in the week, Florence made landfall as a Category 1 hurricane at 7:15 a.m. at Wrightsville Beach, a few miles (kilometers) east of Wilmington and not far from the South Carolina line. It came ashore along a mostly boarded-up, emptied-out stretch of coastline. By Friday evening, Florence was downgraded to a tropical storm, its winds weakened to 70 mph (112 kph) as it moved forward at 3 mph (6 kph) about 15 miles (25 kilometers) north of Myrtle Beach, South Carolina. But it was clear that this was really about the water, not the wind. Several places already had more than 16 inches (40 centimeters) of rain, and Oriental, North Carolina got more than 20 inches (50 centimeters) in just a few hours. Hurricane Florence left major damage in New Bern, North Carolina, after making landfall. Florence's forward movement during the day slowed to a near-standstill — sometimes it was going no faster than a human can walk — and that enabled it to pile on the rain. President Donald Trump is expected to travel to areas affected by the storm early to middle of next week, once it is determined his travel will not disrupt any rescue or recovery efforts. Meteorologist Ryan Maue of weathermodels.com said Florence could dump a staggering 18 trillion gallons (68 trillion liters) of rain over a week on North Carolina, South Carolina, Virginia, Georgia, Tennessee, Kentucky and Maryland. That's enough to fill the Chesapeake Bay or cover the entire state of Texas with nearly 4 inches (10 centimeters) of water, he calculated. A wind gust at the Wilmington airport was clocked at 105 mph (nearly 170 kph), the highest since Hurricane Helene in 1958. Nationwide, airlines canceled more than 2,400 flights through Sunday.